Online marketing can be a pretty cutthroat world. There are just so many data points, metrics, analytics, and hard numbers that you have to deal with that it’s hard to keep them all straight and remember that data isn’t just data. It represents people. Real people. Your customers, in fact. When you were just a mom-and-pop, bootstrapped business you could remember people’s names, what they did for a living, and their kids’ birthdays. Your relationships with your customers were based on good-ole human interaction. Your refund policy may have varied from person to person, but it was fair to everyone. Sadly, that isn’t sustainable. As your number of customers grows, the individualized relationship that you are able to manage with each one diminishes. Once you reach a certain point, if you don’t have a tool to help manage those relationships. In the Good Old Days, that might have been your Rolodex. In 2018, though, it’s Customer Relationship Management (CRM) software. What is CRM Software, and Why Do You Need It? Okay, so in its most basic, most fundamental, most simplistic form, CRM software is an address book with detailed fields about each entry. In practice, however, it’s a whole lot more than that. The best CRM software has contact storage, lead tracking, email templating, lead generation, message coordination, team integrations, and ways to keep them all separate-but-connected. And then there’s the automation tools that come with the best CRM software suites, where you can track folks who halfway complete purchases and send out reminder emails their shopping cart is still full and waiting on them. You can also use conditional logic workflows for internal task delegation, and your team can track entire histories of their interactions with clients or with potential customers of certain products. You can also generally funnel leads using variable split testing. Basically, if you’re running a business online today, you need this to help organize your stuff. But there are a lot of options out there for different business models, so I’ve sorted through a bunch of them to help you figure out which is the best CRM software for you. You’re welcome. Salesforce is the grandpappy of all CRM software. Launched in 1999, it’s hard to go wrong with a product that has nearly twenty years of history, updates, and satisfied customers. Now, nearly two decades later, Salesforce has so many options that it’s really impossible to list every one of them here. Their services are split across different individualize products, rather than trying to be the best CRM software for everyone all the time. If you’re in Sales, you get B2B marketing integration, price configuration tools, and personalized customer quoting software. Marketers get customer journey tracking, messaging across multiple platforms (social, mobile, email), and data analytics and sharing platforms. And the Service a knowledge base, live chat, video calling, and remote issue monitoring. Pricing will differ depending on what plan you use, but it is reasonable for different sized companies. Prices range from $25 per user/month to upwards of $100 per user/month. You can get a 30-Day Free Trial, too. And Salesforce is free for non-profits, which is extra cool. HubSpot is just about as ubiquitous in the CRM world as Salesforce. There’s a reason for that, too. It’s good stuff. Not to mention that it’s free. Well, the base CRM is totally free. You have to pay for additional tools and features, but you do get a pretty good set of features to start with. 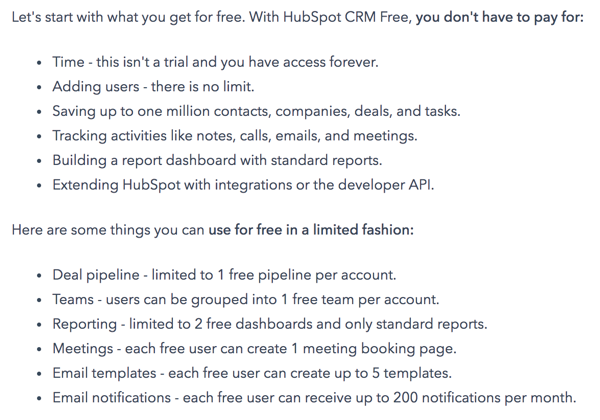 More than anything, the free integration extensions are a great way to see if something like HubSpot is the best CRM software for you and your business. You can connect everything from Eventbrite to Zapier to WordPress to even Salesforce itself to your account. While the free tier doesn’t give you access to any of the automation tools that really make HubSpot shine, but you do get all the cross-indexed lead generation and user tracking that can really set your business up for success. If you look to move past the free tier, HubSpot can be a little pricey: you get a basic package for $50 USD/month, and you can keep adding features you need until you top out at a whopping $2,4o0 USD/month for the whole shebang. There’s a package for everyone here, just depending on what you need. If you like Basecamp, you will really like Highrise. Originally designed by 37Signals (which is now just called Basecamp, after their now-eponymous product), Highrise broke away from its parent company years ago and has flourished on its own ever since. Taking on the Basecamp philosophy of be simple and do a lot, Highrise really succeeds at it. It’s not as flashy as HubSpot or as specialized as Salesforce, but it’s good at what it does. You get a team inbox for managing your leads, email templates that you can use to respond to them, reporting and analytics, task management, and contact filtering through custom fields and case management. And you can extend Highrise a bunch, too, which can lead to some really neat automations that rival the bigger products. In terms of pricing, Highrise is one of the cheapest options out there. There’s a free trial, and after that, it’s only $12 USD/month for a team of 3. The plans scale up from there. Not only does Zoho have a logo that makes you happier when you see it, the CRM has pretty much that effect on you when you use it. Zoho stands out for a number of reasons, but primarily for the Zia AI that powers its data processing. It is unique among CRMs, really. Zia will point out data anomalies to you that you might miss on your own or take some time to see, such as sales spikes or slumps that are not within your company’s typical flow (if you get a Black Friday-style bump on a Sunday afternoon, for instance). There are also automations within Zoho CRM that keep the sales pipeline clear, email and phone tracking through telephony, and honestly what I think is a huge feature, social media tracking for campaign analytics (plus in-CRM interaction with leads). These automations are pre-setup through the Zia feature. You can always set your own. Pricing is actually pretty affordable, depending on your tier. There is a totally free option (not just a trial) like HubSpot. The varied tiers range from $12 per user/month to $100 per user/month. Infusionsoft is designed specifically around email marketing for small businesses. That means it handles segmentation, contact organization, lead generation, and managing/reporting on our data. One of the more notable features that makes Infusionsoft one of the best CRM software choices is what they call lead scoring. The feature takes a look at all the leads you get, and it rates them for you based on behavior, demographics, and interactions (with your team and your site) to give you a score on the likelihood of you being able to close a deal with them. It’s a really nice way to help you and your team prioritize where to focus your efforts. The perks come with a cost, however, and Infusionsoft is not the most affordable CRM choice. You get 30% off for the first 3 months; however, after that the price goes from $99 per month at the lowest up to $497 per month, depending on the number of contacts you want to track. The cost also covers only 1 user account. That makes it not quite as cost-effective as some of the other CRMs out there. And rounding out our list is SuiteCRM, the open-source option I’m sure some of y’all crave. (Here’s the GitHub page for ya, too.) First off, the product is completely free. It’s open-source, after all. SalesAgility, the company who maintains the project, does offer premium support and on-boarding for it. There is a store for add-ons if you find that you need just a little extra functionality. You should know, however, that SuiteCRM is not cloud-based. You will need to download it and install it locally before sending your data around and connecting all your services. That’s a big difference from other CRMs, and it could be a deal-breaker for some people. Also, because it’s free, open-source software, you can set up an unlimited number of folks on your team. That’s awesome. Because it’s open-source, too, the CRM is ridiculously extensible, and it does pretty much everything that the biggest CRMs do — track leads, provide customer support, automate your data tracking and workflow delegation. And if it’s not built in to the primary software, there’s a module or add-on for it (or you can write your own). If you’re not sure if this is the best CRM software to integrate with your company or workflow, you can’t go wrong with trying it since it’s totally free. Which is the Best CRM Software for You? As you can see, there are a lot of options out there to choose from. Honestly, this list doesn’t even begin to scratch the surface of the various CRMs that you really can choose from — there are literally dozens of them out there. But I really believe these are the best options you’ve got. Each piece of software has its main focus set a little differently — such as Zoho using AI for tracking, Infusionsoft demystifying email, or Highrise simplifying team collaboration. When looking at choosing the best CRM software, you have to consider your business’s individual needs. Regardless of what that may be, one of these 6 will most likely be a fit for you. Let us know which CRM software you use and why in the comments! The post The 6 Best CRM Software for Your Business in 2018 appeared first on Elegant Themes Blog.